In the aftermath of a tragedy like the recent school shooting at Santa Fe High School in Santa Fe, Texas, located between Houston and Galveston, shock and heartbreak ripple through our schools, neighborhoods, gathering spaces and places of worship. In the moments when it becomes difficult to comprehend how such terrible acts of violence are possible, we are often left only with our words of hope, encouragement and togetherness - and our urgent desire for our world to be better. As a way of honoring all those affected by the Santa Fe shootings, Volunteer Houston, a Points of Light Affiliate, in collaboration with Jim "Mattress Mack" McIngvale and Gallery Furniture, call upon the voices of our community to ask for help to pay tribute to the bright stars dimmed by this senseless tragedy. We invite you to join others throughout our community and our country who are writing their thoughts and sending them to be shared and memorialized. Follow the steps below to create and share your Stars of Santa Fe, #SantaFeStars. To engage your classroom, team or family in the Stars of Santa Fe project, please print a stencil by clicking HERE or go to Gallery Furniture. Step 1: Print your star, or using a star design of your own, create and cut your star from paper, cardstock or other material of your choosing. Stars should be white to provide the best background contrast for your message and may be up to 8 ½" by 11" in size. Step 2: Share your thoughts, feelings, hopes and messages of support and encouragement on your star. These can be messages to victims, their families or to the Santa Fe community. Decorate how you like. Share a poem, a lyric, or a note. Step 3: Share your Star! 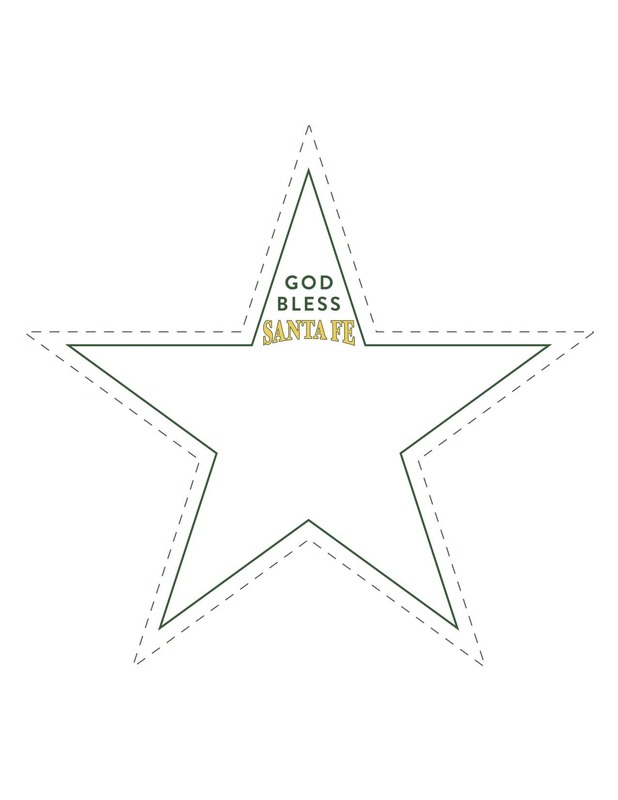 Snap a photo of your star and post it to social media using #SantaFeStars. Volunteer Houston will collect the Stars June 30, and share with the Santa Fe community throughout the summer. Stars of Santa Fe is being made possible through a collaboration with Volunteer Houston, Gallery Furniture, Interfaith Ministries for Greater Houston and organizations who are part of Houston's Coalition Against Hate including: Alliance for Compassion & Tolerance, Anti-Defamation League Southwest Region, Asia Society Texas Center, Catholic Charities of the Archdiocese of Galveston-Houston, Daya, eMgage, Empowering Communities Initiative-Houston, Houston Immigration Legal Services Collaborative, My Brother's Keeper Houston, The American Pakistan Foundation, The Hindu American Foundation, University of Houston Graduate College of Social Work and Zahra Jamal of The Boniuk Institute at Rice University. Should you have any questions, please contact us at Stars of Santa Fe.